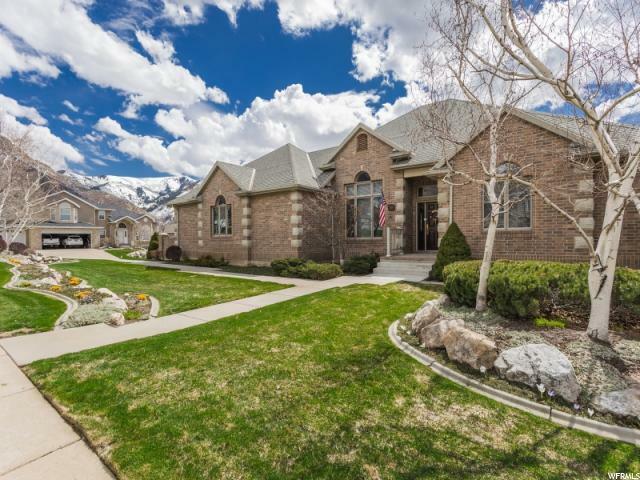 Welcome home to your 5 bedroom, 4 bathroom North Ogden Custom Rambler home for sale with second kitchen in the fully finished lower level. This quality built home has many features both seen and unseen that will delight you. You will be captivated by the luxurious finishes such as 10 foot ceilings throughout the home (Formal Dining Room is 15 feet), hardwood & designer tile floors, 2 tone paint, 8" crown moldings, wainscoting, coffered & tray ceilings and plenty of windows letting in natural light and gorgeous mountain, valley and city views. Enjoy a floor plan that is perfect for everyday living and entertaining with a main floor Great Room with wet bar and double-sided fireplace, a formal Dining Room with built-in side serving counter with granite top, and a large office with plenty of room to work from home in comfort. Your cook will be so happy cooking up feasts in this beautiful kitchen that has plenty of cabinets and granite countertops, stainless steel appliances including a double oven and Jenn-Air downdraft cooktop, 2 pantries, center island with second sink, and trash compactor. Dine in the semi-formal eating area, the Formal Dining Room or out on the deck. Escape the world to your main floor Master Suite and feel like you live in a 5 star resort as you cuddle around the fireplace. Unwind in the private Master Bathroom that has a jetted tub and separate shower, dual sinks and a huge walk-in closet accessible from the bedroom and bathroom. Appreciate having another bedroom nearby and 3 in the basement, providing space for everyone. There are also 2 more bathrooms with showers and dual sinks to eliminate bathroom hassles and a half bathroom for the convenience of friends. Plus, you can enjoy single level living with the large Laundry Room on the main floor (and you will just love all the built in cabinets!) The lower level is beautifully finished and walks out to the covered patio and back yard. The huge Family Room will be a favorite hang out and has another double-sided fireplace. The lower level can also be used as a Mother in law Suite with a full kitchen featuring brand new appliances, a snack bar and eating area. You will love having a bonus room in the basement to use however meets your needs including as a 5th bedroom. Enjoy having a wine cellar with built in racks, or easily convert the room to cold storage by removing the racks. The lower level also has a big man cave/work shop with stairs up to the garage making it easy to take materials in an out without going through your home. 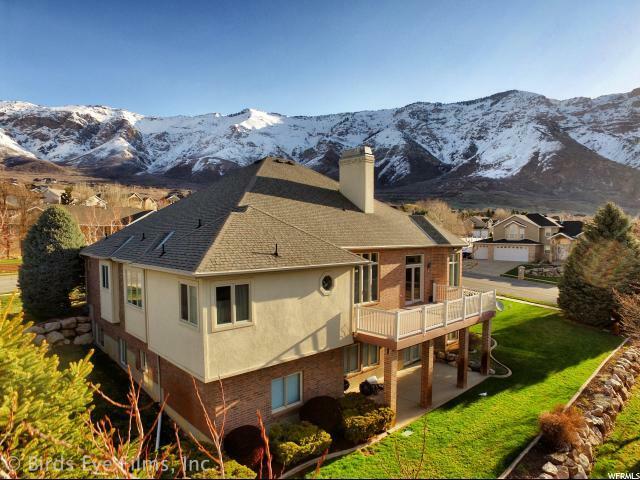 Relax, dine and entertain on the large Trex deck or covered patio as you enjoy gorgeous mountain, valley and city views. The deck is plumbed for gas to eliminate messing with propane tanks. The yard is beautifully manicured and landscaped with automatic sprinklers to make yard care easy. 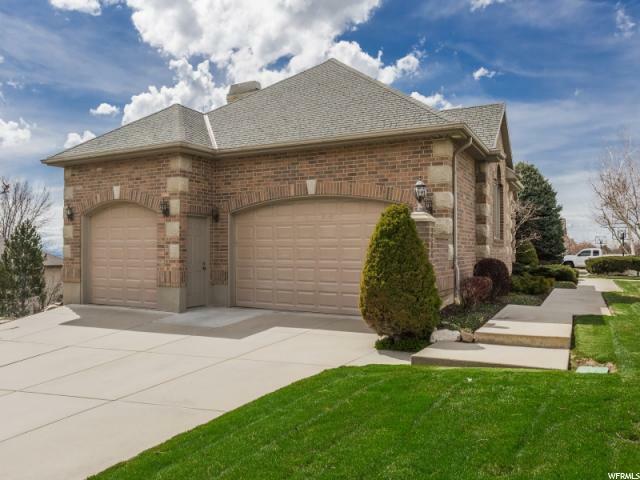 You will love the extra deep, extra wide 3 car garage with room for up to 5 vehicles or plenty of storage. Plus, appreciate knowing this is a quality built home that you can enjoy for years because of the 2x6 exterior walls, R-40 ceiling insulation, R-38 wall insulation, low "E" weather shield wood casement windows, 2 furnaces, 2 water heaters, 40 year roof shingles and more (ask the Listing Agent for the full list of features). 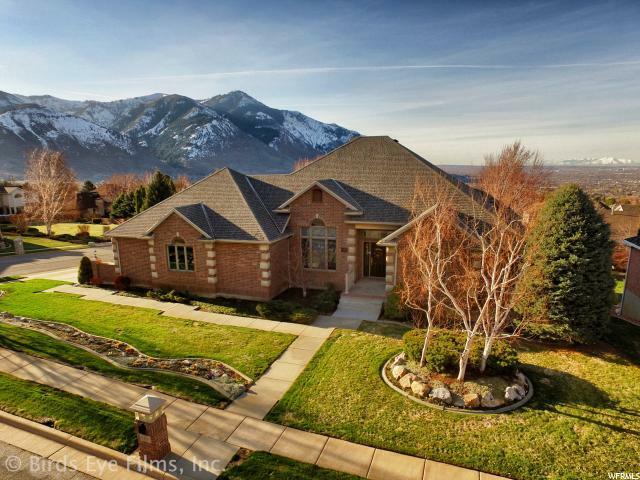 All this is close to shopping, dining, and the recreational options of the Ogden Valley yet away from the hustle and bustle in a popular neighborhood. Call today for your private tour. Square footage figures are provided as a courtesy estimate only and were obtained from county records. Buyer is advised to obtain an independent measurement.